I've been hearing great things about The Body Finder for years now and was excited to see that my library had an eBook available. While I've read many positive reviews on the book, I never really read the summary or even knew exactly what the book was about, so I went into the book without a lot of expectations. My favorite thing about The Body Finder was the sweet, sweet relationship between Violet and Jay. They were so cute together! Their transition from best friends to something more was so well done. The tension was palpable, and I loved the back-and-forth between them. 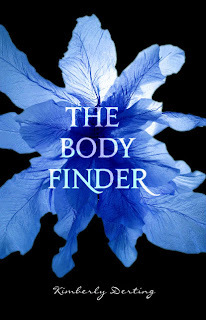 What I didn't like about The Body Finder was how young the writing felt. This almost felt like a middle grade book to me. The plot was predictable, which was another negative for me. But what bothered me the most were Violet's dumb decisions, which continually put herself in danger. I wanted to smack that girl upside the head a few times! I will keep reading the series, and will pick up the next book when I need a light, easy read. Glad you liked it. I enjoyed it but I'm not overly anxious to read the third and final book. Haha, Violet did make some poor choices! But hey, I think I kept reading for Jay - he is one awesome literary boyfriend!